Tyler Union Opens New Distribution Center in Grand Prairie (Dallas), Texas | McWane, Inc.
We are pleased to announce that the new Tyler Union Distribution Center located in Grand Prairie, Texas, near Dallas, began operations in February. This facility will be managed by Bob Lee who transferred from our Tyler Pipe facility. 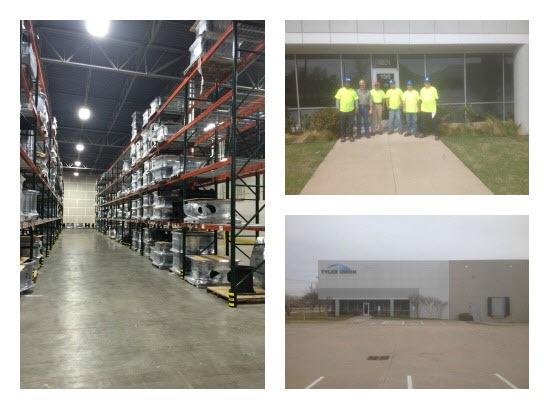 Installation began at this new distribution center in December 2014 and after a few short weeks and with a tremendous amount of team work, they started shipping product on February 17. The facility has approximately 67,000 square feet of indoor storage which will increase efficiency in stocking and picking orders as well as greatly reduce the amount of rework of product needed while at the same time improving their LTL rates and inbound container costs. The team, pictured from L to R in the top right photo, includes Clyde Walter (Warehouse Clerk), Bob Lee (Shipping Manager), Jose Concepcion (Warehouse Supervisor), Byron Brock (Warehouse Clerk), Mark Cotelleso (Warehouse Clerk), and Jimmy Allen (Warehouse Clerk). Congratulations on the expansion, Tyler Union! Posted on April 8, 2015, in Company Advances and tagged Dallas, distribution center, expansion, Grand Prairie, McWane, shipping, storage, Texas, Tyler Union, warehouse. Bookmark the permalink. Comments Off on Tyler Union Opens New Distribution Center in Grand Prairie (Dallas), Texas.